Ergin Cavusoglu's installation "Crystal & Flame" is part of the Free to Air series of exhibitions and events funded by the London Councils that will show throughout the city over a four-year period. The theme of each newly-commissioned project derives from Roosevelt’s ‘four freedoms’ – freedom of speech, freedom of religion, freedom from want and freedom from fear. On exhibit until October 30th at PEER, is Crystal and Flame a three channel video installation commissioned by Film and Video Umbrella under the rubric “freedom from want”. London-based artist of Turkish descent, Ergin Cavusoglu has chosen to present an installation that works on multiple thematic levels while also inscribing itself in the social fabric of the city of London. The artist’s point of departure was a text by the Italian author Italo Calvino, “Six Memos for the Next Millennium” (1988), in which the novelist/essayist charted out a writer’s manifesto well in advance of the new millennium. His six categories or chapters are: lightness, quickness, exactitude, multiplicity, visibility, and finally consistency – a section that was never written due to the untimely death of the author. Cavusoglu embraced Calvino’s juxtaposition of two symbols – crystal and flame – polar forms of aesthetic perfection that we cannot tear our eyes away from. Through precisely filmed images and recorded sound, the artist extrapolates metaphorically on the divergence of these two symbols or absolutes, both aesthetically and morally. 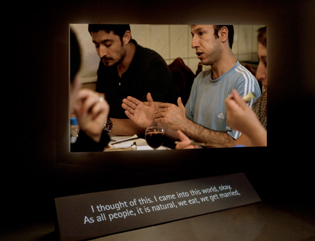 As visitors to Peer enter the first room of the gallery they encounter a video screen depicting a casual dinner scene amongst guests at a Turkish grill restaurant. The verité styled document focuses on one man’s ad hoc recounting of a harrowing tale of children used to smuggle goods across the border between Syria and Turkey over terrain riddled with landmines. 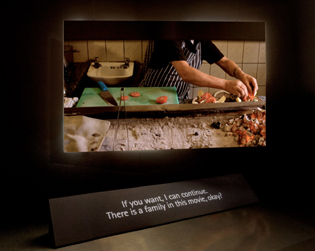 Meanwhile, viewers can peer into a second room where two other videos are projected simultaneously. The smaller of the two screens in this second room is set on an angled platform and depicts in meticulous detail the handling and cutting of a raw stone into a commercially marketable diamond of exquisite beauty. The third screen shows a filmed rehearsal for a theater play based on a Chekhov short story. Freedom from want, as a theme, is grappled with directly by four actors, most blatantly in an argument about philanthropy between a landscape painter and a woman raising funds to aid victims injured by a series of forest fires. This screen is, in various ways, Crystal and Flame’s vortex where meanings and dissonances resonate. As a rehearsal for a stage play, we are witness to a work-in-progress, similar to the diamond cutter’s buffing and polishing of his cold raw stone. The fiery emotions of stage-actors, harnessed by director Robert Delamere, are meanwhile juxtaposed with the simpler restaurant scene in which dinner guests are un-self-consciously just being themselves as they listen to a true-life story. In many ways, Cavusoglu’s work is faithful to the Calvino manifesto that inspired him. While driven by a complexity of themes, there is a lightness that Calvino would have approved of. When seeking an answer as to how multi-tasking can be acceptable within literature, Calvino turns to “brevity” as a key to allow the writer to “unite density of invention with a sense of infinite possibilities.” Those viewing the installation at PEER will be torn between three competing screens vying for their attention, each riveting in its own way. Each viewer will therefore also walk away uniquely affected. But what will undoubtedly remain consistent is the artist’s provocation to each viewer to read his work for its intended themes while remaining open to an infinite sense of wonder and possibility. The sixth and last chapter of Calvino’s manifesto was to be called “consistency”. In many ways, the multi-tasking “Crystal and Flame” forges a balance and strikes a tone within complexity, thus aesthetically performing the missing chapter of Calvino’s “Six Memos for the Next Millennium”. PEER is located at 99 HOXTON STREET LONDON N1 6QL UK. Exhibition ends October 30th 2010. Arnold Barkus is a writer/director working between New York, London, and Paris. He wrote the stage adaptation of the Chekhov short story that appears in Crystal and Flame.